We are so accustomed to thinking of the Kelmscott Chaucer as the great aesthetic masterpiece of Morris’s later years that it comes as a bit of a shock to learn that in one significant respect at least he was disappointed with it. It wasn’t just that he couldn’t persuade Burne-Jones to illustrate Chaucer’s ruder tales; I don’t suppose he ever really expected that he would be able to! No, it is more a matter, as J.W. Mackail informs us in the biography, that ‘when designing the borders for the Kelmscott Chaucer, he expressed his regret at not being able to fill them with Chaucer’s favourite birds’ because of his incapacity for drawing birds and animals (I, 115). I wonder, then, whether Morris’s famous meditation on political defeat in A Dream of John Ball might not also apply to aesthetic defeat? Would it be the case that, in the realm of art too, when the finished work comes it turns out not to be quite what you meant, and other men then have to fight for what you meant under another name? 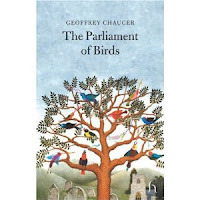 In which case, should we not seek out an enterprising artist today who could design us new Kelmscott Chaucer borders which would indeed feature the vigorous bird life of the medieval poet’s own verse, as Morris himself intended they should? I see from the latest Morris Society Newsletter that visual artist David Mabb, who has done such politically crucial work with Morris designs already, is now "working on improving the Kelmscott Chaucer" (p.14). I imagine that will be a far more radical tweaking than the modest one I propose above.